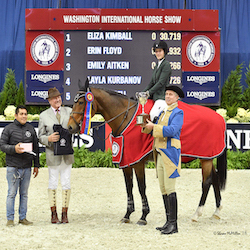 Washington, D.C. – October 24, 2012 – Day two of the 2012 Washington International Horse Show (WIHS) featured the presentation of championship honors in the professional and amateur-owner hunter divisions at Verizon Center in downtown Washington D.C. This year’s professional World Championship Hunter Rider (WCHR) Scott Stewart continued his winning season with multiple division tricolors, the overall Grand Hunter Championship aboard Rose Hill Farm’s Enjoy, and the award for Leading Hunter Rider among his many accolades in the first two days of competition. Wesley Newlands and Daryl Portela earned the Grand Amateur-Owner Hunter Championships. The $10,000 Children’s and Adult Jumper Championships and the first $10,000 Open Jumper speed class were featured during the evening session with Nina Montross, Ericka Caslin, and Aaron Vale coming away with wins. The show will continue through Sunday, October 28. Scott Stewart kicked off the day by winning the High Performance Working Hunter championship aboard Alexandra Crown’s Garfield. Stewart and Garfield earned two blue ribbons over fences and placed third under saddle to be awarded The “NOT ALWAYS” Challenge Trophy, donated by Miss Peggy Steinman. The High Performance reserve championship was presented to Dr. Betsee Parker’s Rosalynn with Hunt Tosh in the irons. The pair won the under saddle and earned two second place ribbons over fences. Rosalynn was also awarded the special Protocol Trophy as the overall High Point High Performance Working Hunter from the Devon Horse Show, Pennsylvania National Horse Show, and Washington International Horse Show. Lynn Ellen Rice in her winning presentation with WIHS President Juliet W. Reid. The big winner this week was Enjoy, a six-year-old Holsteiner gelding by Cassiano that Stewart purchased as a two-year-old and showed for the first time at Capital Challenge last fall. Enjoy has really proven himself this year and had several great rounds in D.C. over the last two days. Stewart and his team work hard to make sure that their horses peak at the right time for indoors, and part of that system is planning the horses’ show schedules carefully. The WIHS is always an important stop in the season, and having a good group of people to help makes a big difference. For Stewart, there is a unique quality to the show that makes it special each year. Pure Abundance and Wesley Newlands. Newlands has owned Pure Abundance, an eleven-year-old Hanoverian gelding by Acord II, for five years. The pair has shown at WIHS three times and this was their first championship win as well as her first leading rider title. The 24-year-old rider was thrilled with her horse. The jumpers took to the arena for the first time on Wednesday with children’s, adult and open jumper classes. Anthony D’Ambrosio, of Red Hook, NY, is the course designer this week. The $10,000 WIHS Children’s Jumper Championship was the first jumper class to be held with an exciting win for 14-year-old Nina Montross, of Bedford, NY, aboard Caprifol. Thirty-two entries showed in the first round of the children’s championship, and eleven jumped clear to advance to the jump-off. Montross and Caprifol, owned by Palm Meadow Farm LLC, completed the only double clear round to earn the victory in 26.456 seconds, which was also the fastest round. For the win, the pair was presented with The H. Fenwick Kollock Memorial Perpetual Trophy, donated by Friends of Fen. “It is really exciting to win here,” Montross stated after her win. Montross started riding in the hunters when she was younger, but quickly realized how much fun it was to go fast." Ana Sia and Haley Schaufeld. Ericka Caslin’s winning mount, Rioletto, is an 18-year-old Royal Dutch Warmblood mare by Olisco. Caslin explained that the veteran mare showed with Christine and Jonathan McCrea in the 1.40m speed classes and has now stepped down to the adult amateur classes. She purchased the mare from Donald and Kara Cheska a year and a half ago. Caslin works full time for the American Horse Council and commutes to Washington D.C. for work every day, so she does not get to ride very often. Rioletto stays with the Cheskas in Wisconsin and Caslin meets them at shows. The Washington International Horse Show continues on Thursday with the beginning of Junior Hunter competition in the morning and Junior/Amateur-Owner and Open Jumper competition in the afternoon. The evening session will welcome local horse lovers, riders, trainers, and their families for the “What’s Your Dream?” themed Barn Night, presented by Dover Saddlery and media partner The Equiery, beginning at 6 p.m. The WIHS is excited to announce that the $100,000 President's Cup Grand Prix, CSI 3*-W will be aired on NBC Sports Network on Sunday, October 28, from 3:30-4:30 p.m. EST. The show will also be live streamed in its entirety at www.wihs.org, and also available on USEF Network on Saturday evening at www.usefnetwork.com. The WIHS Silent Auction is live all week long and includes lots of terrific one-of-a-kind items that can't be missed. Visit http://wihs.maestroweb.com/ to register to bid on the great items or stop by the Silent Auction Area on the Shopping Concourse at Verizon Center to see the items in person. WIHS tickets are available at Ticketmaster.com or by calling 800-745-3000. General admission is $15 Tuesday through Sunday with children 12 and under admitted free for daytime performances before 5 p.m., courtesy of Washington Area Chevrolet Dealers. Reserved and VIP tickets are available for evening performances. Ending times are approximate. For Discounted Group Sales, call 202-661-5061. Tickets also may be purchased in person at the Verizon Center Box Office. For information about Verizon Center accessible seating and services, call 202-661-5065 (TTY). Full ticket information can be found by visiting www.wihs.org/tickets. For full results, more information, or to watch the free live feed of the show, please visit www.wihs.org. 11 625 OFRENDA ANNIE BOLLING ANNIE BOLLING: 0/elim.